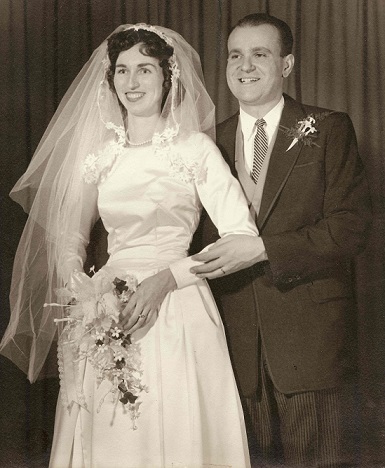 My parents, Betty and Ray, met in New York City at Newman Club, a Catholic social group for young adults. They also had a mutual interest in the nascent sport of downhill skiing. Some of the Newman Club members planned ski trips; it was not a formal club per my Dad’s recollection. My maternal grandmother, Elizabeth, told me this story about their meeting on an Appalachian ski trip: during the trip my dad’s ski pants had a tear along a pocket seam. When he announced his dilemma, my mom volunteered to remedy the situation. The story illustrates the practical nature of my family culture–Dad knew to ask for help and Mom had packed a small sewing kit, just in case. Both parents proved to be skillful with their hands. Mom with needle-based crafts (learned by watching her mother and grandmother,) and Dad with handyman skills, learned at the knee of his building superintendent father. 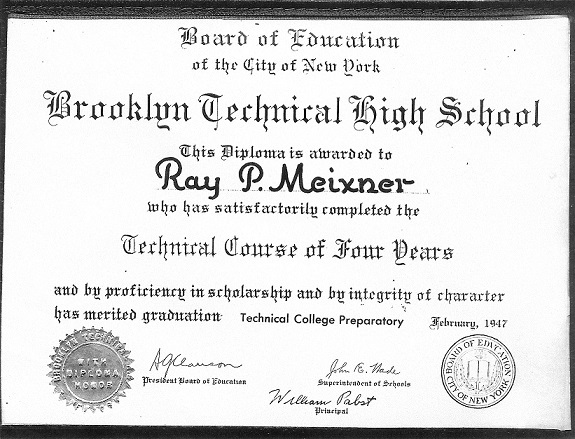 Dad further honed these skills at Brooklyn Polytechnic High School, one of the six magnet schools in the New York City school system. While my dad attended public schools, my mom attended Catholic schools. For high school she attended the girls-only Dominican Academy in Manhattan. Both parents excelled in math and science and continued that focus in college. 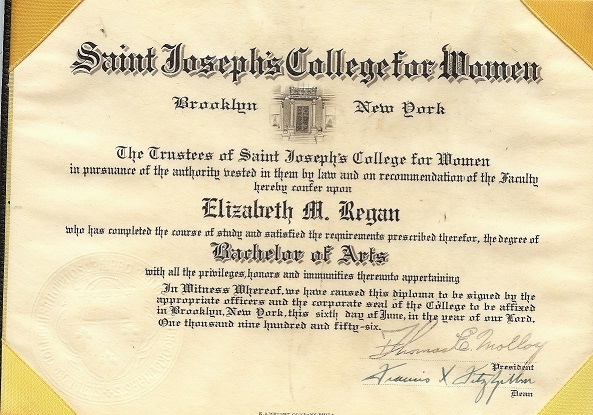 While Mom majored in math at St. Joseph’s College for Women, upon graduation she earned a science medal. She went on to post-graduate studies in mathematics at the University of Minnesota. After high school and a short stint in a factory, Dad studied electrical engineering at Brooklyn Polytechnic Institute. He went on to earn a Masters in Electrical Engineering, also at Brooklyn Poly. Though they experienced totally different school environments, they both commuted to college from their family homes. Dad hailed from Sheepshead Bay and lived on Gravesneck End Road. Mom traveled from the edge of Flushing on 166th Avenue, just off Francis Lewis Boulevard. As products of their time (The Great Depression and World War II,) they spent their money wisely. Yet, they invested in having fun. 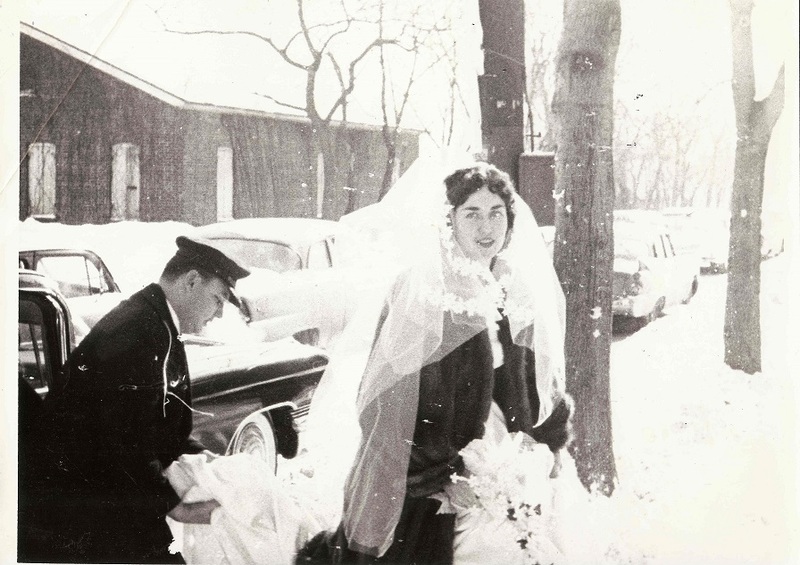 This brings me back to skiing; as you can see from the wedding photos, my parents married between snowstorms, on January 28, 1961. The wedding date had been motivated by their honeymoon plans to ski at Stowe, Vermont. I tell people the Meixner children were born skiing–my parents enjoyed the sport too much to stop. Until recently, I hadn’t told folks that both parents worked as engineers. I can’t pinpoint the reasons for the delay in making such a statement. My mom did not discuss much about her early work life; growing up, Mom taught Math and Science as a substitute teacher. My dad, Raymond Meixner, started his career working with early microwave devices called Klystron tubes. My mom, Betty Regan, supported factories with time studies, industrial engineering work. Most likely she didn’t officially have the title “Engineer.” Today, women engineers continue to be viewed as unusual in the workplace. The numbers have significantly increased since the time my mom worked, in the late ‘50s to early ‘60s. My Mom worked until she gave birth to me, the eldest of four. Of their four children, I am the only one to pursue engineering as a profession. Both parents worked as engineers: I am their daughter, and, I, too, became an engineer. Dear Reader, please share your comments and stories that are sparked by this piece. For instance: what in your upbringing provided some motivation to pursue a career in technology? See Contribute for how you can share a story at The Engineers’ Daughter. I didn’t pursue a career in technology though I use it daily in my life and in my career. However, I enjoyed learning things about your parents that I had not known before although I’ve known you for most of my life. Thanks for sharing their story and their photos. And, congrats on the launch of the website! Appreciate your thoughts. All our parents have back stories that we remain ignorant about unless we know enough to ask. Your blog provoked a question… how does one pick their passion / profession? If you are reading this, please drop a line or two on how you picked/ended up in your particular path. Exposure ? an opportunity to experience for one self? perhaps something your school teacher told you…’you are good at x,y,z’ which creates a certain confidence to pursue further, or most often following a prevailing wisdom – when we were growing up this was become an electrical engineer/ computer science; and now data science. Or perhaps none of the above and it is simply an accident. Neither of my parents were engineers; I picked engineering because, my friends (all of us graduated at the top of our high school) and I chose to apply to a highly competitive engineering school where not only merit but caste played a role in securing a spot. Earlier, I had gotten admission into chemistry but I did not want to pursue this…. so when I was admitted, my path was set – become a female engineer. Looking back and reflecting on this several decades later during which I changed my profession from engineering to consulting, I wonder do I have characteristics that are typically attributed to engineering? yes – some… I am practical perhaps to a fault, sometimes i wish i could dream a little without worrying about how to make these dreams come true; and as a female engineer I have learned to be comfortable as ‘the only female in a room’, the only ‘one with a particular pov when the group held another’, the only ‘mom of my age when prevailing wisdom was to have children & raise them when you are younger so that by the time you are old/retire they have grown up too…’. So it is curious that my path was set by following the prevailing wisdom and I am now anything but conforming to a prevailing norm of what is a female engineer/wife/mom. Appreciate you sharing a bit of your path to majoring in electrical engineering. Peers and teachers can have as much influence as ones parents. I can certainly point to a few teachers in junior high and high school who encouraged pursuing engineering. I believe that exposure to engineering at a young age made me consider engineering. Combined with watching old “Star Trek” episodes which brought up engineering and science on a regular basis I simply did not think about medicine or law as an area of study. As to what brought me to my passion for defects in semiconductors– that’s due to taking a break from college studies and working at IBM. Learning about testing of semiconductors and realizing that there are a myriad of ways that defects can be worked around and detected brought me to my PhD studies at Carnegie Mellon. Which is where I met you. I have never found you to be a conformist so it is no surprise that you became a mom at an age when most women are guiding their children out of the nest. Hi Anne! I loved reading about your parents. Especially about your mother. It was fairly unusual for a woman of her day to pursue engineering, mathematics, and an advanced degree. Such an inspiration and a great story. Thank you for sharing. Appreciate your observations and glad you liked the story. My parents inspired all their children. Interestingly my mother was a math major in college. Going to a school like Smith helped, I’m sure. Education in our family on both sides was more for the women (my maternal grandmother graduated from Vassar.) My oldest brother was the first male on either side to have a college degree. My mother worked until he was born, but when I was two she went back to work part-time, and full-time when I was nine. She was more on the math side (actuarial and taxes), but did become a vice president. By the way, I am also from Flushing. Interesting that both our mothers studied Math. My maternal grandmother took about 9 years off from work, then Union Carbide lured her back to work during WWII. My Mom chose to go back to teaching Math as it fit more with raising children. It is indeed a small world that you are from Flushing like my Mom. Go Mets!